The Commentary observes that the “setting of this chapter is the same as that of ch.4. However, where ch.4 largely describes a scene centering on God’s throne, ch.5 focuses upon the Lamb and the sealed scroll.” And, while God’s “throne” is mentioned eleven times in chapter 4, the same throne is depicted five times in this chapter (verses 1, 6, 7, 11 & 13) suggesting chapter five to be the ongoing scenario begun in chapter 4. So, the context of that quote, to my mind, makes it clear that “judgment” is the focus of chapter 5, namely, the Investigative Judgment of Daniel 7 which will complete what we learned in chapter 4. Up to this point, considerable parallelism exists between the scene in Revelation 4 and 5 and Daniel 7: 9, 10. But, while Daniel’s scene describes a “judgment [that] was set,” he also says “the books [plural] were opened” with nothing about them being held in the hand of Him that sat on the throne. Here, the “book” is sealed shut. But, this chapter tells us how it was opened. Therefore, Revelation 5 can easily be seen as supplementary or complementary to Daniel 7 rather than exclusionary. Consider: “Revelation . . . is the complement of the book of Daniel.” According to the dictionary, one definition of a “complement” is “something that completes or perfects something else.” In that case, the book of Revelation “completes or perfects” the things we find in the book of Daniel. So, while the “books” were already “opened” in Daniel 7:10, Revelation 5 tells us how they (or it) were (or was) “opened.” But, how can the “books” in Daniel 7:10 be the same as the “book” in Revelation 5? Read this statement carefully: “We ask John what he saw and heard in the vision at Patmos, and he answers: [Rev.5:1-3 quoted] There in His open hand lay the book, the roll of the history of God’s providences, the prophetic history of nations and the church. Herein was contained the divine utterances, His authority, His commandments, His laws, the whole symbolic counsel of the Eternal, and the history of all ruling powers in the nations. In symbolic language was contained in that roll the influence of every nation, tongue, and people from the beginning of earth’s history to its close. . . .The destiny of every nation was contained in that book. . . . As the book was unrolled, all who looked upon it were filled with awe. There were no blanks in the book. There was space for no more writing.”  In other words, that “book” was absolutely comprehensive. Nothing can be added, nothing can be taken away. Since the “books” of Daniel 7:10 lay open in the context of the Investigative Judgment  going on in heaven, it is safe to conclude nothing in those “books” “can be added” or “taken away” making them also “absolutely comprehensive.” Consequently, the “book” of Revelation 5 and the “books” of Daniel 7:10 must be the same because absolutely comprehensive records cannot be different in any way. If there were differences, one or the other or both would not be comprehensive in the absolute sense. 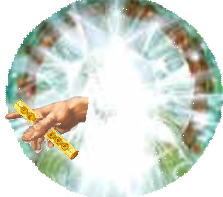 Based on the evidence considered above, plus what we have already found and will find as our study proceeds, the “record” contained in the sealed “book” is inclusive of all the nations, languages, every man, woman and child who ever existed from the beginning to the end of time; or from Eden to the second coming. The history of the Christian church, represented by the seven church paradigm of chapter 2 and 3, represent only a fraction of that time. While the question of worthiness to “open the book” or to open the “books” is not asked in Daniel 7, Christ’s worthiness is taken for granted in Daniel 7:13, 14 where “one like the Son of man” was “given . . . dominion, and glory, and a kingdom, that all people, nations, and languages, should serve him:” Clearly “all people, nations, and languages” is contained in the “books” that lay open in verse 10 as well as in the “book” of Revelation 5. So, again, we can see a complementary relationship in existence between Revelation 5 and Daniel 7. This gives us further insight into the question of how the “books” of Daniel 7:10 came to be “opened.” Although Daniel fails to answer the question directly, saying only “one like the Son of man came . . . to the Ancient of days,” John makes it clear that no human being, or even the angels were qualified to “open” or even “to look thereon.” Once again a complementary relationship can be seen between Daniel’s and John’s description of the same scene. Amazing as it is, from the information gleaned thus far, this book was written in its entirety at the time John sees it presented here even though it contained the record of history from the beginning to the end of time. No wonder all who witnessed this scene were filled with awe of God’s infinite knowledge and wisdom. As David once said: “Such knowledge is too wonderful for me; it is high, I cannot attain unto it” (Psalms 139:6). This is another element not mentioned in Daniel 7 unless the “cogitations” that “troubled” Daniel when he was given the vision “in the first year of Belshazzar” (Daniel 7:28) could be considered something of a parallel to John’s grief. But, while Daniel was deeply concerned with the vision as a whole, John’s concern narrows down to how the “book” (or “books” of Daniel 7) could possibly be “opened” which is supplementary to Daniel’s view where the “books” were already “opened” (Daniel 7:10). This view tells us how they came to be opened. Thus, again, the picture is complementary rather than exclusionary. Consider the implications of John’s grief: If none could be found worthy, utter despair and hopelessness would be the lot of every nation, kindred, tongue and people until the very last war was fought and the last breath was drawn. Eventually, the human race would become extinct leaving the world as desolate as the rest of the planets in our solar system. While that aspect of the judgment was not revealed to Daniel, it was clear to John. It struck him with an overwhelming sense of hopelessness possibly as the sinner will feel when he/she realizes they have been “hurt” by the “second death” (see Revelation 2:11). Nevertheless, Daniel was given troubling insights into the matter of God’s “sanctuary” being made “desolate” and the “abominations” that would make “it desolate” and “the abomination that maketh desolate” (Daniel 8:13; 9:17, 27; 11:31 & 12:11) in some of his other visions that greatly troubled him, which is another possible similarity to John’s concern. Those events actually took place more than thirty years before John had this vision, and he may even have spoken to this “elder”  himself before he was taken up! Daniel, on the other hand, was shown “the thrones [being] cast down [around] the Ancient of days” (Daniel 7:9) more than 600 years before John’s time. No wonder there are differences in the description of the same scene! As a general rule, variations in the accounts of the same scene are to be expected even though the witnesses saw the same thing, and suspicion should be aroused if the accounts were exactly the same. Consider the differences between the first four gospels of the New Testament. The same principle certainly applies to the accounts by Daniel and John. The elder had just asked John to “behold, the Lion [that] hath prevailed . . .” But, when he looked, he “beheld . . . a Lamb as it had been slain . . .” standing up instead of lying down as we would expect of a slain animal. It was standing “in the midst of the throne,” the same position occupied by the “four beasts full of eyes before and behind” (Revelation 4:6). Their multiple “eyes” must be the same “seven eyes” of the Lamb “which are the seven Spirits of God” that John saw “before [God’s] throne” (Revelation 1:4) represented by the “seven lamps of fire” (Revelation 4:5) even though “sent forth into all the earth.” Although a Lamb is noted for its meekness and docility, it had “seven horns” representing absolute power. In all of that intricate, bewildering symbolism, we see three, all-powerful Persons possessing omnipotence, omnipresence and omniscience coupled with absolute justice and mercy, with mercy being the most notable. All through the fives stages of the great image of Nebuchadnezzar’s dream with its head of gold, chest of silver, belly and thighs of brass, legs of iron, feet of iron and clay (Daniel 2:31-45),we see an illustration of historic fact: “power corrupts, absolute power corrupts absolutely.” Only the three Persons of the Godhead are able to cope with such ability for they are absolutely free of any taint of corruption. 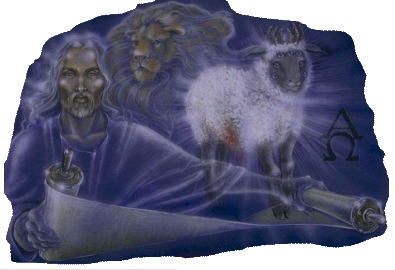 Therefore, the “four beasts” say “Holy, holy, holy, Lord God Almighty!” (Revelation 4:8). God established this judgment session, not so much to identify and vindicate the character and behavior of his loyal followers on earth, but to vindicate His own Character and Behavior before the whole universe! Interestingly, the verb “came” in this verse and in Daniel 7:13 are the only suggestions of movement in either Daniel’s or John’s account of this judgment scene that can be assumed to be Jesus’ transition from the Holy to the Most Holy place in the heavenly sanctuary. John’s view fills the hiatus that Daniel’s skipped over. Instead of Jesus’ immediately being “given . . . dominion, and glory, and a kingdom . . . which shall not pass away,” John’s vision fills in the gap between His coming and assuming “dominion,” by Jesus taking “the book out of” His Fathers “right hand” in order to “loose the seals” and “open the book” (verses 3,4) or “books” before He receives “power, and riches, and wisdom, and strength, and honour, and glory, and blessing” in verse 12. Since “the coming of Christ . 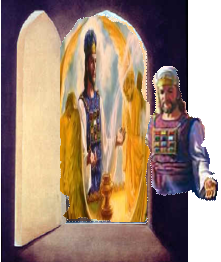 . . described” in Daniel 7:13, 14 “is not his second coming to the earth” but His entrance into “the holy of holies . . . to engage in the last acts of his ministration in behalf of man,–to perform the work of investigative Judgment,” His “coming” here must be indicative of the same thing. Even though it appears “the books,” in Daniel 7:10, 13, were already “opened” when Jesus “came to the Ancient of Days,” when we take into account the parenthetical delaying action of the little horn power in verses 11 and 12, the picture changes allowing verse 13 to be corollary with verse 10. In contrast, no such delaying tactic of a parallel to the little horn power is depicted in either Revelation 4 or 5. But, when our study reaches chapter 13, we will discover many parallels to the horn power and how it delayed the judgment. Verse 8: And when he had taken the book, the four beasts and four and twenty elders fell down before the Lamb, having every one of them harps, and golden vials full of odours, which are the prayers of saints. Understanding this is the inauguration of the Investigative Judgment, October 22, 1844 at the end of the 2300 days of Daniel 8:14, the “four and twenty elders” had been looking forward to this occasion for 1810 years ever since “the graves were opened” (Matthew 27:52) when Christ arose from the tomb. “They were chosen and holy ones of every age, from creation down even to the days of Christ.”  They had waited for nearly two millennia since their resurrection, so it is little wonder they “fell down before the Lamb” to express their joy and gratitude. Note the “four beasts,” who were always alive, had watched Artaxerxes sign the final document to allow the Jews to complete rebuilding the temple in 457 BC, then hovered over Jesus in the manger in 4BC, then His baptism in 27 AD, finally His crucifixion in 31AD. They had rejoiced over Christ’s resurrection then His inauguration as High Priest in the heavenly sanctuary, but then, they too had to wait for another 1810 years for this, and they joyfully shared this exciting moment with the elders. They must have enjoyed sharing this prospect with John even though it would be another 1,748  years in the future before it would take place. Consequently, while God’s people, who were anticipating His coming in 1844 were badly disappointed because of an error in their interpretation, those in heaven were celebrating! 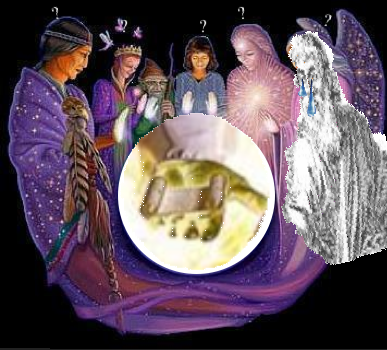 Since the 24 elders must be from some of the “many bodies of the saints which slept [and] arose” (Matthew 27:52) with Christ, “the prayers of saints,” which the “odours” from the “golden vials” represent, must symbolize their own prayers as well as the prayers of the living saints on earth throughout the succeeding generations up to and beyond 1844 even to our day. Therefore, these must be human mediators in heaven making intercession directly to the Lamb for us as they relay, as it were, our prayers to Jesus! Their “harps,” musical instruments used to express the joy of the occasion, are noted again on two other very important occasions in heaven, future even to our time, when the “hundred forty and four thousand” are gathered “on the mount Sion” (Revelation 14:1,2), and all those who “had gotten the victory over the beast, and over his image, and over his mark” are seen standing “on the sea of glass” (Revelation 15:2). Consider that this “new song,” John was hearing, was not actually sung for another 1,748 years! Therefore, what he was hearing was actually a promise of hope for the future, which must have looked very bleak to John, isolated way out on the lonely isle of Patmos. He was being told again, by beholding this scene after he had “wept much, because no man was found worthy too open . . . the book,” that he had no need to fear for the ultimate victory in the great controversy between good and evil. While it seems clear that the 24 elders had been “redeemed . . . to God” by Christ’s blood,” the pronoun “they” is inclusive of the “four beasts” as well as the elders. Some believe, on that basis that the four beasts must also be from the fallen race, but, as we read in chapter 4, there is no evidence to support that belief. Therefore, they must be unfallen beings who have never sinned and therefore are not in need of redemption as we ourselves. Consider this statement: “While we rejoice that there are worlds which have never fallen, [nevertheless] these worlds render praise and honor and glory to Jesus Christ for the plan of redemption to save the fallen sons of Adam, as well as to confirm themselves in their position and character of purity. 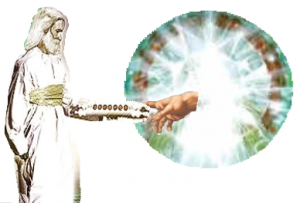 The arm that raised the human family from the ruin which Satan has brought upon the race through his temptations, is [also] the arm which has preserved the inhabitants of other worlds from sin. Every world throughout immensity engages the care and support of the Father and the Son; and this care is constantly exercised for fallen humanity. 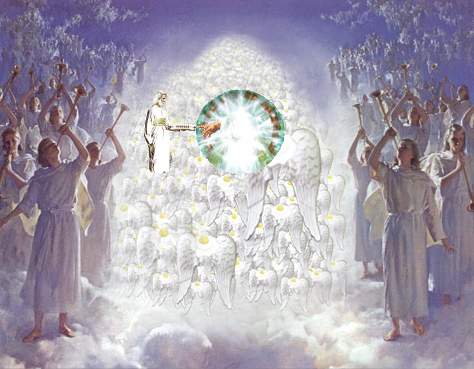 Christ is mediating in behalf of man, and the order of unseen worlds also is preserved by His mediatorial work.” So, amazingly, the unfallen inhabitants of the universe (along with the “four beasts”) were confirmed and “preserved” in their faithfulness by what they have witnessed in the plan of redemption. Therefore this “new song,” echoing “throughout [the] immensity” of the universe when Jesus “took the book out of the right hand of him that sat upon the throne” (verse 7),  was heard on earth only by the few who maintained their faith in prophecy in spite of their disappointment. They were rewarded for their deep study and faith. Consequently, the “passing of the time in 1844 [became] a period of great events, opening to [their] astonished eyes the cleansing of the sanctuary transpiring in heaven, and having decided relation to God’s people upon the earth, . . .”  Therefore, the Lord had, in effect, put a “new song” in their hearts, lifting them from discouragement, gloom and disappointments to renewed courage, faith and hope. Again, these are the words of the “four beasts” and 24 elders depicted in verse 8 who are speaking in the present tense. They echo John’s words in Revelation 1:6 after declaring Jesus “washed us from our sins in his own blood, . . . hath made us kings and priest unto God . . .” While the “four beasts” dwell “in the midst of the throne, and round about the throne,” the 24 elders are also gathered “round about the throne” of God and seated on “four and twenty seats” (Revelation 4:4 & 6). They all act as subservient “kings” to the supreme king of the universe. Nowhere else in the Bible is this particular scene mentioned in the Bible except in Daniel 7:10, reaffirming the complementary/supplementary relationship between John’s and Daniel’s visions of this same scene. The twice used number “ten thousand” is from the Greek word “murias” which could also be translated “myriads” an “innumerable multitude.” Recent astronomic observations have revealed the fact that there are multiplied billions of galaxies in the heavens each containing billions of stars. Other observations are beginning to show that each star is probably surrounded with a solar system of planets much like ours. If each planet were populated (unlike ours, of course), the number of the inhabitants of the universe is absolutely beyond comprehension. Therefore, this verse is but a faint glimmer of the size of the vastness of the universe with its multitudes of intelligent beings that surrounds the throne or the immensity of space that the throne and the heavenly sanctuary command. But, while speculation is fascinating, that is not the main point here. Note the parallelism of this verse to Daniel’s when he saw “thousand thousands ministered unto [the Ancient of Days], and ten thousand times ten thousand stood before him:” (Daniel 7:10). Verses 12 to 14: Saying with a loud voice, Worthy is the Lamb that was slain to receive power, and riches, and wisdom, and strength, and honour, and glory, and blessing. And every creature which is in heaven, and on the earth, and under the earth, and such as are in the sea, and all that are in them, heard I saying, Blessing, and honour, and glory, and power, be unto him that sitteth upon the throne, and unto the Lamb for ever and ever. And the four beasts said, Amen. And the four and twenty elders fell down and worshipped him that liveth for ever and ever. In effect, verses 8 to 14 is a doxology, a celebration service rendering praise to the Lamb all because “he had taken the book,” a document containing the absolutely comprehensive account of every man, woman and child from the beginning of earth’s history to its close. Christ, who “washed us from our sins in his own blood.” His shed blood gave Him the ability to take and open the book. Because of the enormous stakes involved in its opening, and the hopelessness that would cloud the future of all the peoples of the world, as well as the universe, were it to remain closed, this doxology seems to depict a collective sigh of relief on the part of the heavenly onlookers that hope and joy has now replaced doom, misery and hopelessness, and all because of the Lamb. This is the complementary scene to what Daniel saw when there was “given” “one like the Son of man . . . dominion, and glory, and a kingdom, that all people, nations, and languages, should serve him: his dominion is an everlasting dominion, which shall not pass away, and his kingdom that which shall not be destroyed” (Daniel 7:13, 14.). While it may appear to some it is merely academic to argue in favor of the parallelism existing between Daniel 7:9, 10 and 13, and Revelation 4 and 5, further study will show that the ramifications of these parallels are enormously significant to the understanding of the rest of the book of Revelation. Testimonies for the Church vol.9 pages 266, 267 (bracket, ellipses and italics supplied) see also SDA Bible Commentary, Vol.7, page 770 where the last paragraph is quoted. see Daniel 7:9, 13, 22. Maxwell suggests since God is seen “taking His seat on one of” the thrones “in some new place” in Daniel 7 while in Revelation 5 He is “already seated on His throne” is one of his five reasons to believe “that the two scenes are really not the same.” (God Cares Vol.2, page 170) But, consider: while Daniel 7 shows Him taking His seat, it is not really necessary for that action to be repeated in Revelation 4 and 5. Furthermore, the “throne” in both scenes must be the same. See note 27 for reason number 2.
 this “book” probably looked like a scroll that had to be unrolled and rolled in order to read the text. Manuscript Releases Vol. 12 page 296 (italics and ellipses supplied) see also Manuscript Releases Vol. 9 page 7; Vol. 20 page 297; Last Day Events pages 186, 187.
 see Great Controversy pages 479, 480 if any are in doubt Dan.7:13 depicts the Investigative Judgment. SDA Bible Commentary, Vol.7, page 771 ((top of left column) where Christ Object Lessons page 294 is quoted saying: “the decision of the Jewish rulers to reject Christ ‘was registered in the book which John saw in the hand of Him that sat upon the throne.’ Apparently, then, that sealed book includes more than a record of events during the period of the Christian church, . . .” But, that statement follows with an exception as follows: “though the prophecies of the Revelation are specifically concerned with the latter.” In other words, the Commentary favors the conclusion that the “sealed book” is concerned only with the history of the Christian church in spite of evidence its concerned is universal. Interestingly, Mrs. White calls “one of the elders” “one of the strong angels” in Manuscript Releases Vol.12, page 297 297. Maxwell suggests because Daniel 7:9-14 “presents a very dramatic arrival of the Son of man on the clouds of heaven” before the Ancient of Days while in Revelation 4 and 5 “John simply becomes aware all of a sudden the that Lamb is present” is another reason “that the two scenes are not really the same.” (God Cares Vol.2 paged 170) But, he does not take into account the trumpet-like voice belonging to Jesus that invited John to “come up hither” in Revelation 4:1. Therefore John was fully aware of Jesus throughout the scenario beginning even in chapter 1! See note 38 for reason number 3. Maxwell suggests because “the books are already open before the Son of man makes His appearance” in Daniel 7:9-14 while “the little scroll is closed . . . sealed with seven seals” in Revelation 4 and 5 is another reason to believe “the two scenes are not really the same.” (God Cares Vol.2, page 170, 171) But, Maxwell also notes that Revelation 6:1 to 8:1 “continues to describe the Lamb’s activity as he continues to break open the seals” which I see as John’s description of the process by which the “books” in Daniel 7 came to be opened. Clearly, then, John’s account of the opening is complementary to Daniel’s and not exclusionary. See note 46 for the next reason number 4. “’Ten thousand’ is evidently not meant to be a literal number, but rather implies numberless hosts. It is probably drawn from Dan.7:10.” (SDA Bible Commentary, Vol.7, page 773 under “Ten thousand.”) It seems unfortunate no mention is made of the other very significant parallels. 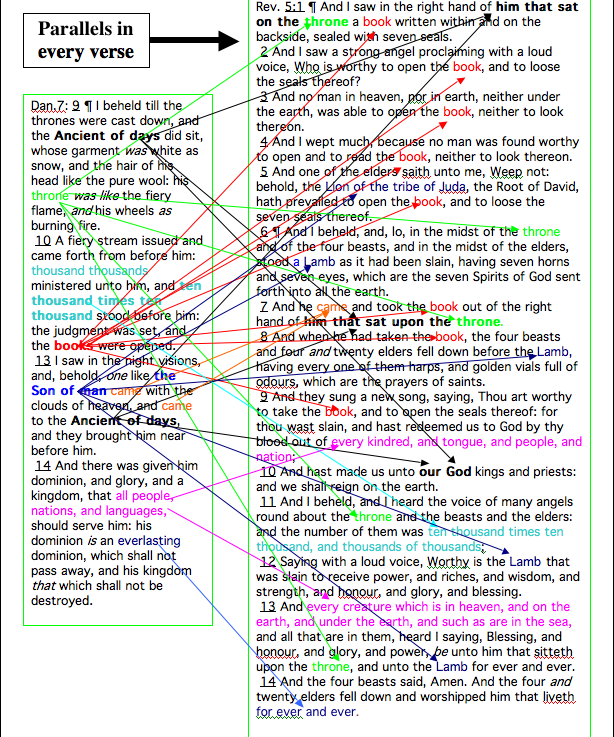 Maxwell suggests that because “we are not informed” “Whoever it may have been who opened the books of Daniel 7” while in Revelation 4 and 5 “the point is emphasized that no created being in the entire universe could break the seals of the scroll; only the Lamb could break them” is another reason to conclude that the two scenes are not really the same.” (God Cares Vol.2, page 171) But, if we are willing to acknowledge that Revelation 4 and 5 is complementary to the scene of Daniel 7, it is not a difficult matter to conclude “One like the Son of man” in Daniel 7 being parallel to the “Lamb” in Revelation 5, is the only One qualified to “open” the “books” of Daniel 7. See note 47 for Maxwell’s reason number 5. Acts of the Apostles page 585 (bracket supplied). Maxwell again suggests that while “Daniel 7:9-14 is unquestionably a judgment scene” and Daniel 7:10, 22, and 26 expressly indicate that it is. By contrast, Revelation 4 and 5 is not labeled a judgment scene.” Therefore, in his estimation he concludes that “Daniel 7:9-14 and Revelation 4 and 5 describe not the same but two different events.” (God Cares Vol.2, page 171) But, with the great concern depicted in Revelation 5 regarding the opening of the “book” of records what other “event” could it be besides a preparation for judgment? Obviously a specific label is unnecessary to come to the correct conclusion that the two scenes are the same. see Revelation of Jesus Christ, Commentary on the Book of Revelation, by Ranko Stefanovic page 210. Testimonies for the Church Vol.9 page 267 italics supplied.